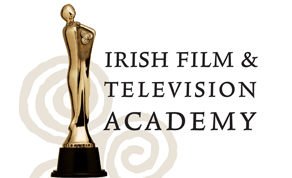 The winners of the 2015 IFTA Gala Television Awards were announced at a ceremony at the Double Tree Hotel in Dublin on Thursday, October 22nd. Celebrating the highest standard of output of Irish television programming of the past twelve months with the strong support of Gala Retail as the headline sponsor of the Awards Ceremony, the event was hosted by Chief Executive of the Irish Film and Television Academy, Áine Moriarty, who congratulated all winners and nominees working in the Irish television industry. IFTA welcomed those working in television in front of and behind the screen, television directors, writers, actors and producers whose work was showcased throughout the evening. The IFTA Gala Television Awards is the showcase of Ireland’s television industry calendar and celebrate the very best of Irish television across all TV Programming from entertainment, comedy, Soap and Performance to factual, current affairs and news across all of the Irish broadcasters RTÉ One, RTÉ Two, TV3, 3e, TG4, Sky, UTV and BBC Northern Ireland. The IFTA Gala Television Awards saw Brendan O Carroll receive the Lifetime Achievement Award for Comedy following the worldwide success of award-winning ‘Mrs Browns Boys’, presented in a moving tribute by Gay Byrne, one of the first broadcasters to bring Brendan to our screens many years ago – the tribute included messages from Roddy Doyle, Joe Duffy, John McColgan, Rory Cowen, Jason Byrne and many more. Hosted by actress and television presenter, Amanda Byram, the Awards Ceremony will be televised on TV3 on Friday 23rd October 2015 at 9pm. Gala Retail are the official title Sponsor of the IFTA Gala Television Awards. Big winners on the night included TV3’s ‘Red Rock’ which won three awards for Best Soap and Continuing Drama, Best Director in a Soap or Comedy (Lisa Mulcahy) and People’s Choice TV Show of the Year. Other winners included ‘Mrs Brown’s Boys’ (Comedy), 50 Ways to Kill Your Mammy (Entertainment) and writer/actress Sharon Horgan won two awards (Female Performance and Writer) for her work on Channel 4 comedy ‘Catastrophe’. Guest presenters on the night included Miriam O Callaghan, Rachel Wyse, Ronan Keating, Imelda May, Kathryn Thomas, Maria Walsh, Barry Murphy, Republic of Telly’s Kevin McGahern, Vogue Williams and Andy Quirke, Emmerdale’s John Bowe & Bhasker Patel Amanda Brunker, Brent Pope, UTV’s Alison Comyn, Tristan Rosenstock (TG4), Martin King and Lucy Kennedy, Colette Fitzpatrick, Jedward, Karen Koster and Anna Daly. Among those in attendance celebrating the industry were Rory Cowen (Mrs Browns Boys), Jennifer Gibney & Danny O Carroll (Mrs. Browns Boys), Deirdre O Kane, Victoria Smurfit, Rosanna Davison & Wes Quirke, Gay Byrne, Nadia Forde, Baz & Nancy Ashmawy, Anthony Murnane, Bryan Dobson, Sharon Ní Bheolain, David Rawle and Ian O Reilly, Norma Sheahan from Moone Boy, Lisa Fitzpatrick, Lorraine Keane, Matt Cooper, Cathy Belton and Jane McGrath, Enda Oates and Martina Stanley (Fair City); Catherine Fulvio, Brendan Courtney, David Brophy (High Hopes Choir conductor), Jenny Buckley (UTV); Sean Mahon (Red Rock), Norah Casey, Anna Daly (TV3); Joe Duffy (RTE), Mairéad Ni Chuaig (TG4), Bill Cullen and Jackie Lavin, Darren Kennedy, Lisa Cannon (TV3), Elaine Crowley, Second Captains Live (Mark Horgan & Ken Early), Sinead Kennedy and Eoghan McDermott. This year TV3 will deliver coverage of all the excitement around the Red Carpet, Nominees, Special Guests, Backstage interviews, and Winners from the Ceremony in an exclusive (non-live) one hour ‘Awards Special’ programme broadcast on TV3 at 9pm on Friday 23rd October.